Store cilantro so that they have some breathing room (otherwise they will melt down on you—too much moisture speeds decay). Try removing the band so that they are spread out, wrapping them in a paper towel or cotton cloth, then placing in plastic/airtight—that’s how I’ve had the best luck keeping them fresh. You might also try storing in a jar (used like a vase), but with a bag draped over the leaves, so that the tender leaves don’t dehydrate on you. Most of the flavor in cilantro is in their stalks, so be sure to include that when you dice it up for recipes. Cilantro is a great item to have on hand, it can go with any Mexican-inspired dish as well as your Thai dishes (think lime, curry, coconut, shrimp). Of course, it is great dumped on top of tacos, and can also be mixed in with butter to eat with sweet corn. Greens beans make a great side for dinner—try sautéing them in little olive oil and garlic. They are also just as good lightly steamed and topped with ghee or coconut butter. To cook more evenly blanch first by adding to a pot of boiling for 2 minutes. Then drain and put in ice water to stop the cooking process. Sauté garlic in olive oil and add green beans, sautéing until lightly seared. Add salt and pepper to taste. Green beans can also be easily baked in the oven like any other vegetable. Simply spread out evenly on a baking sheet, drizzle with olive oil, salt, pepper, and garlic powder, and toss to coat. Bake at 425° for 15 minutes. Take out after about ten minutes and shake to turn. Sprinkle with some parmesan and serve. Turnips can be sliced up and eaten raw with a little salt and lemon juice atop a salad. They can also be cooked much the same way as a potato, you can even boil them until tender and make mashed turnips. You can also roast, sauté, or add to soup. To season try a combo of salt, pepper, and lemon or when baking, toss in coconut oil, salt, pepper, ginger and drizzled in honey (roast at 400° until tender). Toppings: butter, salt, pepper, chives and parmesan. How to make pico de gallo — a fresh tomato salsa — with tomatoes, onion and cilantro. Makes 8 servings or about 3 cups. 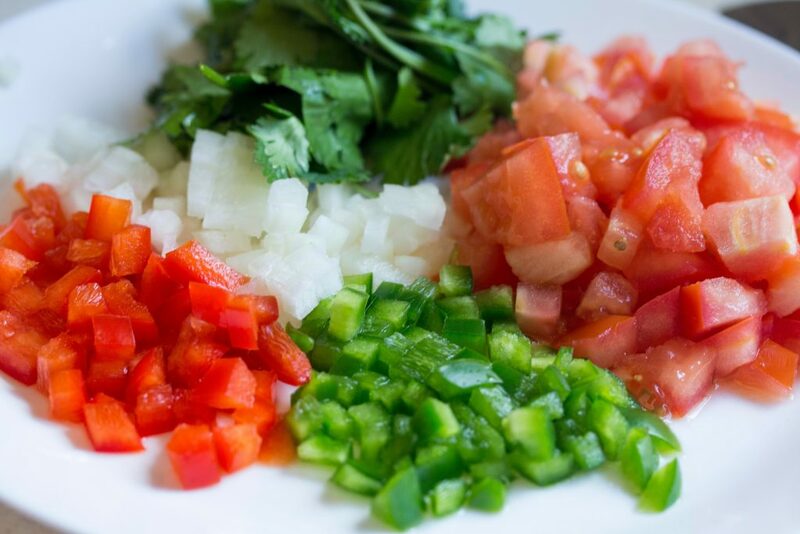 Add the tomatoes, onion, cilantro, diced peppers and lime juice to a bowl. Generously season with salt — start with 1/2 teaspoon and go from there. Set the salsa aside for 30 minutes to let the flavors meld. After 30 minutes, stir the salsa — making sure to distribute the juices left at the bottom of the bowl. Taste and adjust with more salt (hint: you’ll probably need more than you think, so, taste, salt, taste, salt). Store for up to 3 days in an airtight container in the refrigerator. Last week I delved into weeding and our strategies to combat the looming invasion that comes with plowing and planting. This time of year is especially hard on folks with allergies. My fields look like it has snowed! Living near the river also means living near cottonwoods, and this time of year all my freshly tilled beds are also freshly seeded with cottonwoods now! If I walked away today and did nothing more out in my fields, there would be a million trees sprouting this Spring and a new forest would take over. Nature is not a fan of bare ground and will constantly look to “plant” something in the freshly tilled ground. I know this. I get it, which is why I try to keep most of my ground planted and only actively till ground that I want to grow vegetables on keeping the rest in pasture, orchard or cover crops. This week we are planting buckwheat, not to harvest for people food, but to feed our soil and also cover the ground. In this case, I am choosing what to cover the ground with as opposed to letting nature pick! There is a lot more thought that goes into my strategies, but you can sum it up as mimicking nature and working with nature to grow the healthiest food possible. One of the challenges as a farmer, small business owner, husband, dad, grandpa, coach, volunteer is finding time – time to do anything, and it all feels important. I am constantly juggling. It is the same for most of you. A few of you might be thinking, “What is he talking about?” Well, I am talking about weeds! A lot of our life is more like a garden/farm. Weeds are always entering our world. If there is a free moment, it has 10 weeds that are looking to fill that space. And unless we plan and anticipate, the opportunistic nature of “life weeds” will overwhelm us. Bear in mind, weeds are not always bad, but they are not essential either. This means as the farmer of our lives we get to make room for the important crops and be diligent to limit the weeds – not a small task! Food is something that consumes a lot of time, especially when you are managing blood sugar or fighting cancer or trying to lose weight. Sadly, the Standard American Diet, aka SAD, is more akin to weeds than food and the whole food system, organic or conventional, is built around processed sugary and/or fat food choices. May I state the obvious: processed food is everywhere and it is hard to eat a healthy “weed” free diet! That is why we advocate eating more fruits and vegetables and keeping lots of them on hand. We also recognize that weeds are prolific and fill every nook and cranny. Purchasing less processed foods is the first step to keeping less healthy food choices out your pantry limiting their access to your life and your health. Thanks for eating fresh fruits and vegetables and making Klesick’s a part of your life’s weeding strategy. We want you to be the healthiest you that you can possibly be so you can enjoy this wonderful life. Store tomatoes in a single layer at room temperature and away from direct light. Refrigerate only after cutting, as refrigeration makes tomatoes lose their flavor. Slicing tomatoes are great to eat raw, fried (quarter first), or broiled; they are great paired with a little olive oil and salt, herbs such as basil and cilantro, and fresh cheeses such as mozzarella and ricotta. And yes, you can totally freeze those extra tomatoes for fresh flavor all year (slice first). According to studies done at Cornell University, cooking tomatoes actually increases the lycopene content that can be absorbed in the body as well as the total antioxidant activity. Sheet Pan Roasted Veggies: Try roasting slices of tomatoes along with the cauliflower, mini peppers, and garlic from this week’s box with a little olive oil, sea salt & pepper in a sheet pan at 375 for 35-40 minutes until your crisp veggies are al dente (roast cauliflower for 20 minutes before adding the rest of the veggies so they all finish at the same time). This Asian vegetable is in a class all on its own. It has a delicate and almost foam-like texture but can be quite versatile. Try sautéing in a little olive oil and freshly minced garlic or follow the recipe below. I recently discovered that baby bok choy has a nice flavor without being cooked at all (not sure why I didn’t try it this sooner!) Plus, it has a wonderfully crunchy texture, which I love! So, if you’re not a fan of the squishier consistency of cooked bok choy, try tossing it into a salad with other salad veggies (try using diced apple and raisons in this one!). Then top with your favorite dressing (a ginger vinaigrette works great) or try making your own! You could simply mix olive oil and vinegar with a little mustard (my go to), or try something a little fancier by blending ½ cup of soy, hemp, or almond milk, ½ cup cashews or ¼ cup cashew butter, ¼ cup balsamic vinegar, and a teaspoon of Dijon mustard. It’s incredible how versatile this vegetable can be. Soaking up and blending with whatever flavors surround it, cauliflower fits right in just about anywhere. But cauliflower doesn’t have to go with anything. It’s great all on its own! Simply break it up into small pieces, toss in some olive oil and garlic salt, spread on a baking sheet and bake at 400° for about 15-20 minutes until golden brown. Cutting out grains? Try this cauliflower pizza crust. The sweetness of these crunchy veggie lies in their shell. Unlike shelling peas, sugar snap peas are best enjoyed fresh, shell and all. Simply “snap” off the stem bit, and you’re good to go. Great just on their own, they also go well on top of salad, in with pasta, sautéed (lightly) with any Asian-inspired dish or casseroles. Use within 5 days for best flavor and freshness. Light yet filling. A delicious, gluten-free meal for those busy weeknights! Makes 8 wraps. Wash and cut veggies. Wash chicken thoroughly under cold water, pat dry, cut into cubes. Heat and grease a frying pan or wok. Cook chicken on the hot pan until fully cooked and browned. This will take ~10 minutes on medium heat. Remove from heat and allow it to cool. Heat olive oil in a pan (can use the same pan), add ginger and garlic. Cook for 1-2 minutes. Add peas, bok choy, and onions and cook for a minute. Add bell peppers and cook until the veggies are al-dente (vegetables should be crisp tender) (NOTE: you may need to add more oil, or, try chicken broth if they look dry). Stir in the coconut butter and a dash of soy sauce or other favorite sauce if using. Mix together chicken and veggies. Add salt, chili flakes and mix it well. Serving suggestions: enjoy over a bed of brown rice or white rice. Or, spoon the chicken filling into the center of lettuce leaves—serve immediately before the leaves start to wilt. I always know that I am planting at the right time of the year because everything else around me is germinating too! And oh boy, it looks like it has been a good year for the other seedlings – AKA Weeds! As an organic farmer, I have a fairly high tolerance for weeds and weed pressure. Really weeds are just misplaced plants or in my case, just happen to germinate in mass wherever I want a crop to grow! But I have learned a few things in my 20 years of farming: better to weed early, the earlier the better. Given my high tolerance for weed, one could say that I have built a fortune of weed seeds in my farm’s “Weed Bank.” And just to be clear, I am not talking about marijuana, although in the 1970’s the largest marijuana crop was being illegally grown across the street from my farm. Now to be fair, this was before my time and the current neighbors. But as lore goes, the illegal crop was planted in the middle of a field of cow corn. As luck or bad luck would have it, the marijuana outgrew the corn, and someone spotted it from a helicopter. As they say, “The rest is history.”. Not to be outdone, the Miller Road lore continues. Nissan was filming a 300zx commercial on our road. Boys and testosterone are not a good mix for the windy farm road we live on. Well anyway, the same field that grew the marijuana/corn crop had been converted to pasture and the film crew was a little nervous with the bystanders observing all the happenings. Apparently, Ferdinand the Bull didn’t care for the color of a RED sports car cruising by, so they asked the farmer kindly to put the bull in the back field. And lest you think I am telling another yarn, there was the time that a young man with a brand-new motorcycle was drawn to the Miller Road (must have a siren call). Just as he was feeling his “oats” (farm talk for being a little too big for “yer” britches) coming out of the first corner heading into the straight stretch he met the “S” curves and laid that bike out about 60 feet into my strawberry field. Thankfully, only his pride and his bike were bruised. Even more thankfully, my daughters had finished picking the berries about 30 minutes before! Still gives me the chills just to reminisce about it. Boys, testosterone and the Miller Road. Thankfully, the Miller Road is now a dead end and we don’t get near the bypass traffic we used to. Oh, back to the weeds. I am talking about dandelions, thistles, chickweed, pigweed, henbit, grasses, and Lamb’s quarter. Nothing to this farmer is more beautiful than a freshly tilled and planted field and nothing is more short lived than that memory. In a week it will look like a blanket of green and purple weeds. But if you plant straight rows and start weeding early, you can knock that first flush back. But the longer you wait the harder the work. So around here we try and weed soon and weed often! Add them fresh to salad as a garnish. Store them like you would flowers: in a vase on the counter until ready to use. Artichokes can be steamed, boiled, baked or grilled. To bake, cut about an inch off the top and stem of the artichoke. Then cut it in half and remove the fuzzy part in the center with a spoon. Rub the cut side with a half a lemon, squeezing some juice into the fold and the middle. Drizzle with olive oil, sprinkle with salt, pepper and freshly minced garlic. Bake on a cookie sheet for about 25 minutes at 425°. Melted butter or mayonnaise mixed with a little balsamic vinegar is commonly used for a dip but you can be creative and use whatever your taste buds desire! Try adding chili flakes, smoked paprika, or fresh herbs to the dip. The Fresh turmeric rhizomes look similar to ginger. Turmeric’s flavor is more vibrant when fresh—peppery, earthy, slightly bitter. Peel turmeric with a vegetable peeler before using, but only peel the amount you’re going to use, to keep the rest of the rhizome from drying out. To use, you can zest it (our favorite way), grate it, or slice it up small into discs or cubes. Radishes a bit too peppery for your taste? Try poaching or sautéing them, you’ll be surprised at how mellow their flavor gets! In the raw, radishes are great as a topping to your salad, tacos, or as a side to Asian or Mexican cuisine! Remove the leaves and give the bulbs a quick rinse before storing to keep them freshest! Rinse the rice in a medium-mesh strainer under cool running water, swishing it with your hand occasionally, until the water runs clear. In a 4-quart saucepan, combine the coconut milk, turmeric, 1/2 tsp. salt, sugar, cinnamon, and cardamom. Stirring frequently, bring the milk to a gentle boil over medium heat. Remove the pan from the heat, add the raisins, and let steep for 20 minutes. Return to a low boil, reduce the heat to very low, and stir in the rice and pepper flakes. Add additional water if mixture looks too thick and you’re worried about the rice sticking (you can always cook it off). Cover and cook until all of the liquid is absorbed, 10 to 12 minutes. Remove the pan from the heat, and let the rice stand, covered, for 8 to 10 minutes. Fluff with a fork, then serve topped with the pistachios. I have never direct seeded Green beans in April before. As a matter of fact, I have never seeded Green Beans at the same time as Sugar Snap Peas either. The weather pattern is shifting and after a few years of extra-wet springs followed by a heat wave, I am starting to have to adapt to this new weather pattern. Last year really caught me off guard. This Spring we started our transplants a few weeks later than normal. I was getting nervous that even starting 2 weeks later wouldn’t might have not been late enough. But the weather broke in our favor and we were able to empty the greenhouses and transplant thousands of romaine, green and red leaf plus seed those green beans, peas, kohlrabi, cucumbers, yellow and green zucchini, chard, bok choi, mizuna, frisée, beets and sweet corn. This week we will continue to seed more lettuces and winter squash in transplant trays, plus direct seed the list mentioned above. What used to be a slow warm up in weather and the farming season has become a mad dash to capitalize on the soil moisture and heat. I am feeling pretty good about where we are to date. I am planting my favorite winter squash – Delicata this week. If you haven’t cooked up the Delicata from last week, get cooking, it is so good! As a farmer and a business owner involved in the organic food world, I can assure that food doesn’t magically appear. I will grant that it is somewhat magical that wind or bees can pollinate a crop of apples or kiwi berries or cucumbers! Absolutely fascinating and magical. As an organic farmer I spend a lot of time thinking about how to enhance the biology and ecosystems on my farm to attract and keep as much wild diversity as I can to. We do everything from bird, bat and owl houses to planting beneficial flowers, to trees for birds to nest in and escape to. We plant cover crops to feed the soil food web, which in turn feeds the plants, which in turn feed us. Working with nature and its wild cohabitators is absolutely vital to a successful farm and food production system. The solution to Americas health crisis is right here on my farm. It would be also be helpful if the other Washington would implement meaningful food policy that didn’t line the pockets of the chemical and multinational food companies. But I don’t see that shift happening soon, so it will be up to you and me to say “no” to their food and “yes” to real food and real nutrition grown on farms that respect your health and the environment. Which is why I get up every day and source or grow and deliver the freshest organic produce I can find. Serving local families with healthy food is all we have done for the last 20 years and I don’t see any reason to change now. Their crunchiness makes them especially good for pickling (think kimchi), but they are equally good cut up into matchsticks and served alongside carrots and broccoli to brighten up that veggie platter. Try it: thin slices atop your next homemade avocado toast. The first thing I do when I bring spinach home is to wash it and lay it out on the counter to dry (or dry in a salad spinner). Don’t put it away sopping wet. This way it will last longer and be ready to use when needed. Another great way to keep spinach longer is to freeze it. If I’m not going to use it fresh, say in a salad, then frozen spinach can be used just as well in cooking or in a smoothie. I love having spinach in my freezer because I know I don’t have to worry about it and it’s always available when needed. When storing in the freezer make sure to wash it first and let dry. Also, cut off any roots and stems you wouldn’t eat and put in an air tight container vs. a bag. This will keep it from getting freezer burned and is also easier to grab and put away. Refreshing, crunchy, and slightly tangy, this Asian-inspired recipe is good and simple! In a bowl, mix soy sauce, vinegar, sesame oil, honey and sesame seeds. Peel and cut Daikon and carrot into very thin into match sticks. Mix your veggies well with dressing. Enjoy! Mom is one of the most powerful words in every language. Everybody has one and half of us get the opportunity to be one. Moms are world shapers, molding the future and working hard to make this world a better place. It isn’t easy to raise children and it is often a misunderstood and daunting task, but because of moms our communities are richer places to live and better places for our children to grow up. And for those of you who have chosen to be one, ultimately only you know the joys, heartaches and busyness that comes with being a Mom. Now we’ve probably all had cucumber salad at some point, but I still tend to forget that it makes a great main ingredient for salad, not just as a topping. Try marinating thinly sliced cucumber, onion, bell pepper, crushed garlic cloves in a one to one mixture water and white (or cider) vinegar and a tablespoon of sugar. Cover and let sit in refrigerator for a couple hours. If you leave it overnight the flavors come out even more! Drain and enjoy. Try adding a garnish of freshly chopped parsley or dill. Drizzle with ranch and hot sauce to taste if desired.